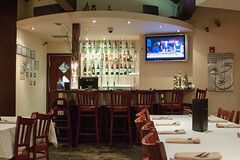 Earlier this year, I went out with several friends to The Elephant Walk in Cambridge, MA for Cambodian food, and that outing reminded me how much I like the traditional dishes and flavors of Cambodia (similar to Vietnamese, the combination of French and Southeastern Asian influence makes for some particularly tasty dishes). 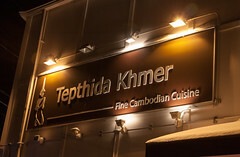 In any case, as I was heading back from last week’s trip down to MIT, I decided to take a small detour and check out Tepthida Khmer in Lowell, MA. Located on Chelmsford Street just south of downtown Lowell, Tepthida Khmer is a small, unassuming place from the outside, but inside it’s a nicely-appointed dining room with a small bar and several neatly-set tables. It doesn’t have a lot of staff: there was a single waitress working there, and apparently at least one person in the kitchen as well, but they were easily able to keep up with the orders of a Wednesday night. Menu-wise, Tepthida Khmer is classic Cambodian, with many of the standard dishes I love: Loc Lac (marinated meat served over rice, available with beef, fish, or chicken), Cha K’Nhei (a very flavorful and pungent stir fry with heavy amounts of ginger), Samlah (traditional sour Cambodian soup), and Cha Greung (lemongrass chicken). Quite frankly, everything on the menu looked tasty, and the smells coming from the kitchen were a pleasant essence of ginger and lemongrass. 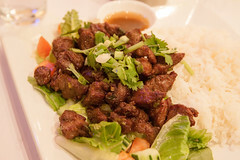 Looking it over, I decided to go for one of my favorites: Loc Lac, with a side of fried spring rolls. The spring rolls were a great start to the meal. 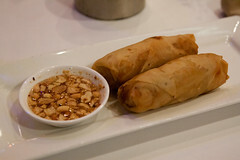 Served up with a pleasant peanut sauce, the rolls didn’t have any exotic ingredients, but were perfectly prepared: the interior was nice and flavorful and still slightly crunchy, the wrapper perfectly crisped, and, most importantly, the rolls were light instead of heavy and greasy. Too bad more places can’t do spring rolls this well. But the Loc Lac was the star of my simple dinner. Loc Lac isn’t a fancy dish: it’s primarily cubed meat (steak in my case) that’s been heavily marinated and crisped up, served with simple vegetables (lettuce, tomato, and carrot, in this case) over a bed of rice. But it’s the very simplicity of such a dish that makes it great: the meat was tender and juicy, with a very strong and flavorful marinade heavy on the lemongrass and fish sauce, and it was seared to a perfect crisp, with little packets of flavored beef that nicely complemented the crunch of the veggies and the starch of the rice. This was a simple dish done to perfection. Overall, a great dinner. My only regret with Tepthida? Going by myself, so I could only try one of the many great-looking menu items. I’ll have to come back soon with friends in tow.